About 2,000 women in Bosnia have protested against a ban on wearing Islamic headscarves in courts and other legal institutions. The ban includes all religious symbols but explicitly mentions the hijab. The women marched for around an hour through the capital, Sarajevo. Hijab-wearing was banned by the communist authorities while Bosnia was still part of the former Yugoslavia until 1992, when it declared independence. The protest came in response to a decision by Bosnia’s high judicial council, which supervises the functioning of the judiciary, to ban «religious signs» in judicial institutions. Some of the women held signs saying «The hijab is my right». Protest organiser Samira Zunic Velagic said the ban was a «serious attack against Muslim honour, personality and identity» and said it was aimed at depriving Muslim women of their right to work. The ban has also been condemned by Muslim political and religious leaders. Muslims make up about 40% of Bosnia’s 3.8m population. The others are mostly Orthodox or Catholic Christians. 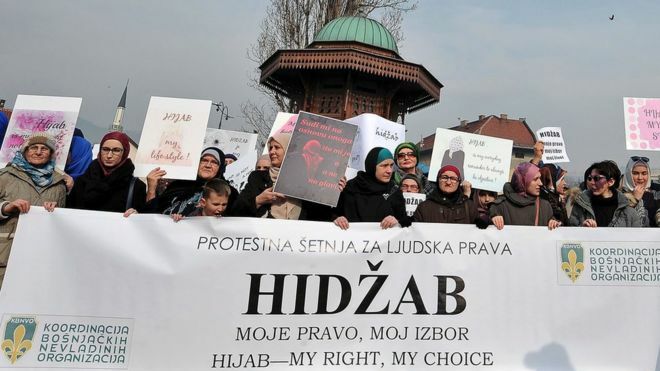 Bosnia women protest at ban on headscarf – BBC News.